Just like humans, dogs can develop problematic plaque and tartar that can lead to serious health issues over time. To keep your dog’s teeth healthy, you have to get on a routine of dog dental care. In this article, we’re covering tips and tricks on how to brush your dog’s teeth and when it’s time to get some dog dental care at the vet. Read on to find out everything you need to know! Regular brushing and annual teeth cleaning are required to lift plaque and tartar from your dog’s teeth. Plaque is a build up of the bacteria leftover from food particles and so on. If it is not removed, it hardens into tartar. Tartar is difficult to remove and can lead to gum disease, cavities, tooth decay, and even spread harmful bacteria into the bloodstream or liver. These problems can be damaging and in the worst cases life threatening to your pup’s health, not to mention affect their quality of life. Brushing your dog’s teeth can be tricky and stressful for you and the dog alike. Learning how to do it properly with the right supplies will help make the process a whole lot easier. First, pick out the right toothbrush and toothpaste for your dog. While the basics are the same, there is a big difference between dog dental care supplies and human ones. There are two main types of dog toothbrushes. Both have soft bristles and come in multiple sizes. The first type is a food grade silicone mold brush you slip over your finger. This is easy to use because you can have a good sense of the amount of pressure you’re applying and the movement of the brush in your dog’s mouth. These brushes are great when you’re getting your dog used to brushing and for puppies or smaller breeds. The other main type of dog toothbrush features multi-directional bristles that can help you clean hard to reach areas of the teeth and gums. Plus, brushing three sides of the teeth at once means a better, more efficient clean. These brushes are great for larger dogs. Dog toothpaste is fluoride free and comes in a large variety of flavors that will appeal to dogs. Fluoride is extremely poisonous to dogs so it is very important to get pet specific toothpaste rather than using the same thing you use on your own teeth. Plus, since your dog will inevitably swallow the toothpaste, it cannot contain foaming agents that will irritate your dog’s stomach. Once you have your supplies, it’s time to get to brushing! 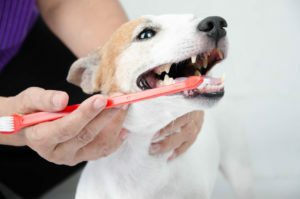 At first, it may take some time for you and your dog to get comfortable with brushing. Ideally, you’ll start brushing your dog’s teeth when they are a puppy so they’ll get used to the process early on. Regardless of their age, be sure to approach brushing as a positive experience. You’ll set a very negative tone for your dog if you are nervous, angry, or causing them pain. They’ll quickly learn that this is a stressful experience and hide from you the second they see the toothbrush. Instead, pick a time, such as after exercise, where your dog is calm and relaxed. Reassure them with constant praise throughout the dog dental care. Start each time by letting them lick a little toothpaste off of the brush or your finger. End each time with a tasty treat or other reward so they learn that this is a positive experience that they hopefully won’t mind after a while. The right position depends on the size, breed, and personality of your dog. Some dog owners find it easiest to brush their dog’s teeth while they lay on their side. For smaller dogs, it may be easier to pick them up and hold them securely while you brush. Either way, you’ll want to keep them still without applying too much pressure or intimidating them. Prioritize the front surface of their back teeth and the canine teeth first by brushing gently in small circles. The roughness of a dog’s tongue helps to clean plaque off of the interior of their teeth and gums, but brushing will help supplement the cleanliness there as well. Be patient, it is against a dog’s instincts to let you brush their teeth. If only they could understand that proper dog dental care adds years to their life! Ask your vet for a personalized recommendation, but typically vets say you should brush a healthy dog’s teeth at least one to two times per week. Every day is best. If your dog yelps, cries, or shows other signs of pain, tooth decay, or gum disease, take them to the vet for a check up as soon as possible. Also, take your dog to the vet for a checkup if they have persistent bad breath, loose teeth, excessive drooling, or loss of appetite or weight. Typically, an annual cleaning at the vet is enough to keep your dog’s mouth healthy. Some dogs, such as older dogs, dogs who have had poor dental attention in the past, or small breed dogs may need cleanings more often. Many dogs are able to get a proper cleaning without anesthesia. For severe cases, a deep cleaning under anesthesia may be required. Many vets will typically suggest teeth cleaning when your dog, for whatever other reason, needs surgery. This is a great way for the vets to do a thorough job without hurting, stressing, or traumatizing the dog. There are also dog dental care chews, treats, and drops that can help with plaque and tartar control. For dogs who hate brushing or owners who forget to brush their dog’s teeth often enough, these can be a great supplement to help keep your dog’s mouth healthy. Vet Nearby is your go-to resource to find a vet or to find more informative articles for pet owners. Do you have tips and tricks on brushing your dog’s teeth? Let us know in the comments below!